When we last checked in with Major Thom, he was trying to get into the Druid Temple but didn’t know how to determine whether it was a night of a blue moon. It turns out that the game tells you quite explicitly in the text that the moon is blue, so I needed have worried. On the night of the blue moon, at midnight, I burned the four sacred plants in the four braziers, and the way to the temple opened. 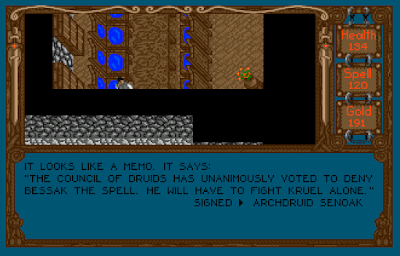 On a conference table, I found a memo that indicated that the Council of Druids had declined to help Bessak. “He will have to fight Kruel alone,” it said. Unfortunately, there was no word on where Bessak went after that. 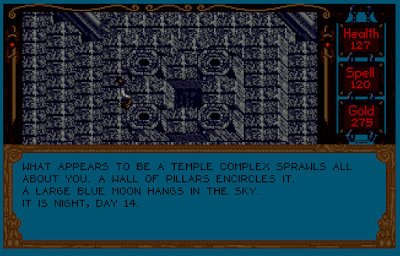 The second level of the temple got a lot harder. It was a giant maze with four different entrances, swarming with druids who attacked me with some kind of force lightning. I hoped the druid cloak would disguise me, but it didn’t do anything. I swiftly started to run out of clear and blue potions, which restore health and spell points respectively. Enemies respawn as quickly indoors as they do outdoors, so there’s no way to clear them all and yet fewer ways to run away from them. At the same time, another problem became clear. I hadn’t slept since waking up that morning. Since the Druid Temple requires you to stay up until midnight to even enter, you’re bound to run into fatigue problems unless you plan accordingly by staying up the previous night and then sleeping until dusk on the day that you go to open the temple. There are no beds in the temple, and I later confirmed that you can’t open the temple on one day, then go away to sleep, then come back to enter. The door closes while you’re away. Still, I pushed forward. The second level maze (a book said that druids love mazes) led to a stairway to a third level, where a bunch of twisting corridors–again swarming with hostile druids–led to the shore of an underground lake. 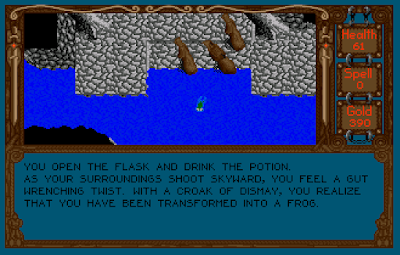 Since you can’t swim in this game, the only way I could find to cross the lake was to quaff a green potion, which polymorphs you into a frog. I had two green potions at the time. Where’s Baba Yaga when you need her? In the next few days, I accomplished most of my list. I spent a little time fighting random enemies and got my experience points over 11,000–the highest value needed for any of the training courses. 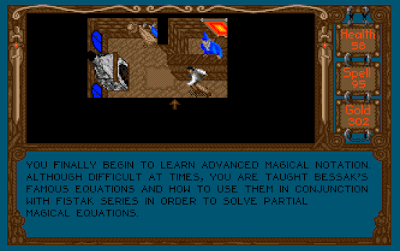 In Murkvale and Castleguard, I took “Advanced Lockpicking,” “Transformations,” “Advanced Swordplay,” and “Advanced Spellcasting.” With the money I made while grinding, I bought about a dozen of the blue and clear potions. Unfortunately, I couldn’t find any place that sold green potions. But I figured I’d try again and perhaps find an exit or some other resource that I missed the first time. Then the blue moon came unexpectedly on night 17. I was nowhere near the temple. To make sure this didn’t happen again, I saved the game and then burned a few days in Castleguard, watching for the next blue moon. It came on night 22, as I would have expected. So I’m not sure why night 17/18 was the one weird departure from the pattern. Anyway, that gave me four days to screw around, so I decided to revisit some of the mountain locations. I originally set out hoping to find the dragon’s cavern and kill it with dragonsbane, but I couldn’t find it again. I couldn’t even find a cavern of the same shape as the image in my last entry, so it wasn’t just a matter of the dragon not being there. I stopped at the occult shop and sold my wyvern eggs, hoping their absence would stop wyverns from dive-bombing me with rocks, but it didn’t do anything. 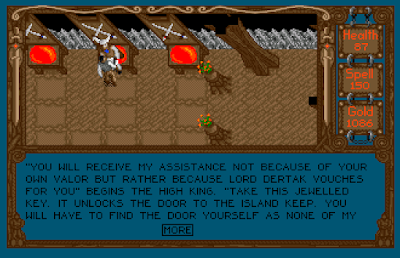 But while searching the mountains, I was surprised to find that my lockpicking skill now worked at Lord Dertak’s Holde. 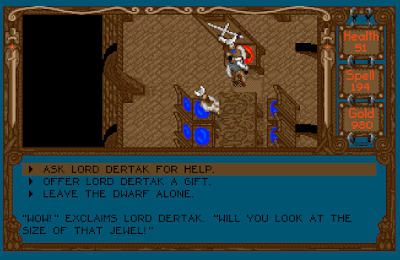 (The game map has it as “Dervak,” but all the text in the castle gives it as “Dertak.”) Entering, I found a large dwarven keep of two levels. 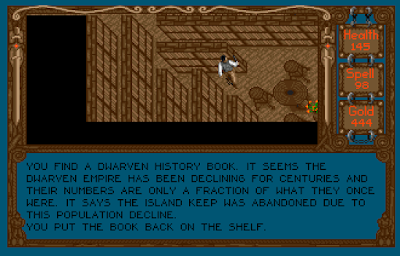 Among the books in the library and the few NPCs in the tavern, I learned that dwarves are the original inhabitants of The Realm. Humans encroached later, and the dwarves “deeply despise” the human settlements. The dwarven population has been declining for centuries, forcing them to abandon the “island keep.” Dertak, meanwhile, is said to be an amiable dwarf who bears humans no particular ill will. He has been known to grant humans favors in return for gifts. He particularly likes jewels. I still had a couple of days, so I returned to the mines west of Castleguard and employed my pick axe. Sure enough, I found a few generic jewels but also one that the came called out as a particularly large jewel. 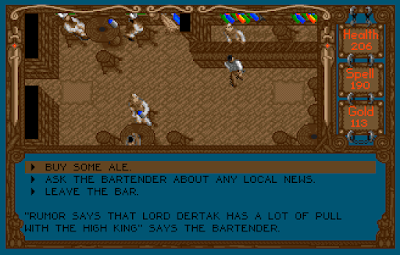 When I took the large jewel back to Dertak, he gave me a letter of recommendation for the dwarven high king, whose “holde” is in the mountain range north of Dertak’s. With one day remaining before the blue moon, I went there. The third level had the living quarters of the hold, but unlike Dertak’s, it was swarming with (respawning) hostile dwarves who attacked me. (They’re the same dwarves who attack on the surface.) Fighting my way through them, I reached the dwarven high king, who didn’t seem to mind that I’d made my way to him by slaughtering his subjects. He took the letter and gave me in return a jeweled key that unlocks the door on the abandoned island keep. He then “expelled” me from his hold, which took me back outside automatically instead of forcing me to fight through dwarves. That was nice. I had just enough time to make it to the Druid Temple–and again through that damned maze–before midnight. I did the ritual again and opened the door. This time, things went a bit easier. I got the two spells from the books and decided to use the exit spell (rather than the third green potion) to get out. I really hope I don’t need that somewhere else. I checked my statistics and was surprised to find that my “score” had risen from 10 to 110 (out of 190). In one session, I went from 5% game completion to almost 60%. I returned to Bessak’s keep, thinking he might show up there now that I’d found the spells he wanted from the druids, but he was nowhere to be found. So the only thing I can think to do at this point is to try the island keep. 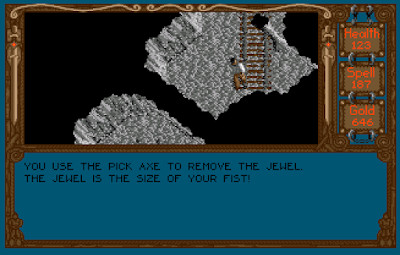 Before I go, I have to spend some more time complaining about the combat system. It’s not just bad; it’s exhausting. The animated .gif below shows what happens when you stop and pause for just a few seconds. Enemies spawn constantly, and stopping to fight one is just an invitation for others to swarm you. You never really “end” combat; you just finally decide to break away. Getting from one place to another becomes an extremely tedious affair. The combat system itself makes it worse. Victory and defeat are a matter of pixels–in a game where the graphics and controls aren’t quite good enough to find-tune your alignment. And upgrades in equipment don’t seem to make things much easier. I hardly notice a difference between wearing enchanted armor and wearing nothing. All the guild courses, attribute increases, and investments in increasingly-better weapons have only marginally improved upon my character’s performance with a pocket knife at the very beginning of the game. Offensive spells don’t help much. “Fireball” (which you can equip like a weapon) doesn’t do any better than physical attacks and it’s very hard to aim. (The same is true of missile weapons.) 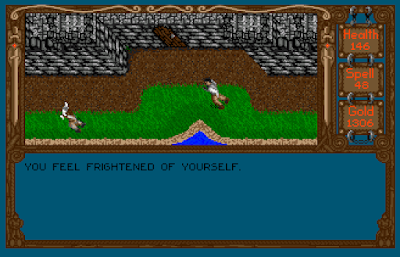 “Pinok’s Paralyzing Spell” (which freezes every enemy on the screen) and “Fistak’s Fear Spell” (which causes them to run away) are theoretically useful but have such a high cost that you can’t rely on them. The “Fear” spell sends enemies scurrying away but costs 50 points. 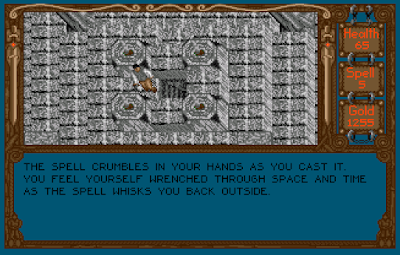 Still, experimenting with spells for the purposes of writing this entry led to some interesting results. At some point, I collected a spell called “Wyvern Morphing Spell,” which transforms you to a wyvern. It only works outdoors, but it’s probably my key to getting to the island keep, unless I want to rent a raft and paddle it all the way up from the delta. I otherwise don’t know the purpose of renting rafts, though. 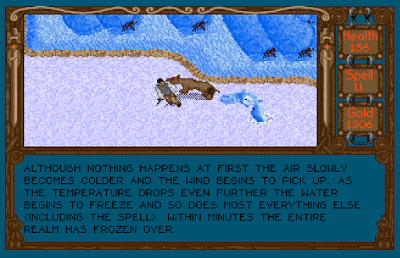 “Kruel’s Winterblast Spell” sounds like an offensive combat spell, but instead it’s more akin to Ultima‘s “Armageddon,” turning the whole world to ice. I don’t know when I’ll need such a spell, but it doesn’t seem like something I want to cast randomly. The spell froze the sea serpent that was on-screen at the time, but that didn’t stop a wolf from spawning and attacking while I was taking this screen shot. 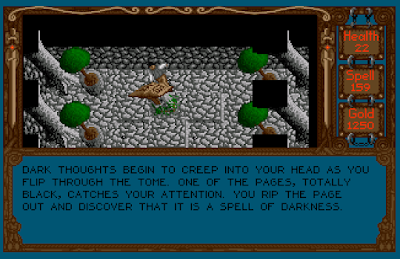 The uses of “Grorph’s Spell of Darkness” are equally mysterious–it blankets the area around you in darkness, making it impossible to see. Two others–“Mascar’s Spell of Protection” and “Portal Activation Spell”–never seem to do anything no matter where I use them. Lords of Time has some decent moments when it comes to exploration and puzzle-solving, unfortunately marred by the enemy and combat systems. I’m ready to enter the home stretch. I just hope that by the end, the game delivers some kind of explanation for its title. 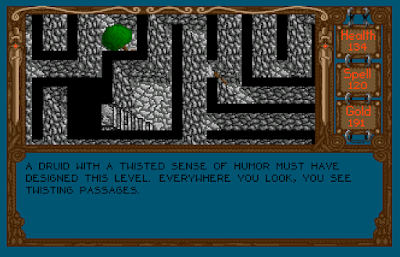 If anyone has played and gotten anywhere with the 1989 text-RPG hybrid Advanced Xoru, I’d appreciate a line. I thought it would be a quick one, but I’m hopelessly stuck. 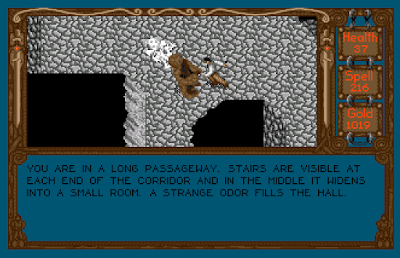 NEXT POST Next post: Phantomas 2.0 – Overhauled classic for the Amstrad CPC is finally here!